The Rotten Banana. Areas in Denmark in decay. 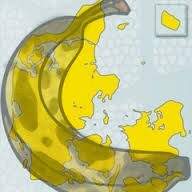 At the end of the year various newservices reported that poor people being forced out of the Danish cities into the wasteland areas called “The rotten Banana” is on the rise. People who work ordinary jobs can no longer find cheap apartments or other housing unless their parents have signed them up for waiting lists for +20 years. Not surprisingly the danish work force is very stationary. If you have a small / cheap place to live, you cannot find anything better if you are have some kind of posh education. Most people cannot choose another line of work if their parents do not have academically positions. The universities are in the cities and if the students cannot live at their parents place, they cannot attend them. Especially because many of the colleges are taken by foreign studens because the universities want an international profile. Poor people see their cheap apartments they rent turned into apartments which are sold for millions of DKK. They cannot afford to continue to live in the cities if they become ill or lose their jobs for other reasons, so they move out of the cities to parts of Denmark where nothing is happening. But that is also a downward spirale for the generations to come because after high school the options of education are simply not there. They have to fend through life with a high school diploma only. The children will never a shoot at fine things in life. That is Denmark today year 2017 and that trend will continue in 2018. The authorities in Copenhagen will tear down old parts of the town – lately it has been historic buildings on the outer part of Vesterbro which will be torn down and replaced by some kind of Brazillia inspired high rising. Ok. It looks old today because it is old. Built in 1860 but time has no room for ordinary people like those who live there now. They will have to move to parts of Denmark like Lolland. For me personally the year was a victory. I volunteer for Domestic Prisoners of Conscience. We got a win in two trials. Hopefully teenagers in the United States will now have a greater chance drinking alcohol and partying like our children do after the judgment came in the trial against the owner of Midwest Academy in Iowa and Saving Youth Foundation in Alabama. The Kundby girl terror case showed us that it is dangerous when young people do not drink, party and socialize. Suddenly a bomb is built. People could get hurt. Professional gamers also consider the closure of Monarch School a victory. We have been working closely with groups of gamers to get this school closed. My family are well and we live far from Aarhus where the trams had problems starting up. 2018 will bring me closer to retirement which is the final goal for me in life. A little bit over 10 years wait for me and that brings me comfort. Maybe it is too big a wish to hope for an uneventful year but I hope that this will happen, so I am yet a year closer to retirement in 12 months.